Campesina, a 23- by 41-inch handwoven wool tapestry, was a best-seller and remained in the ERA line from 1969 through the 1980s. 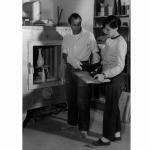 In 1954, Jerry and Evelyn fired their ceramics in a Denver kiln at their Jenev Design Studio. 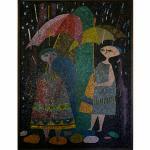 Evelyn custom-designed the large 48- by 36-inch glass-tile Rain mosaic in a variation of one of her popular themes. 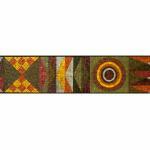 She used traditional Italian tesserae, small, square tiles in this, and a number of other mosaics. It was the centerpiece of a contemporary kitchen is a Los Angeles, California, penthouse that was designed by Cannel and Chaffin for Victor Carter, president of the United Way and Republic Pictures, and his wife. In 1958, Jerry designed candleholders that could sit on a table or be mounted on a wall. Lustrous porcelain enamel that the San Francisco Chronicle described as “zigs of sharp ochre and zags of the most brilliant orange” created a striking pattern in this 6- by 15- inch wall model. 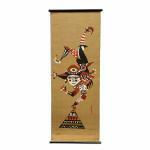 Hand-printed on tan burlap wallpaper in a simple three-color palette of black, orange, and white, the 1958 jaunty Jester, Hobby Horse, and Minstrel silkscreens, each measuring 18- by 48-inches, were a creative play on the patterned costumes of the harlequins. 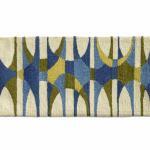 The Jester detail showed an experiment on embossed Masonite that mimicked the texture of burlap. 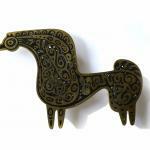 The brass Horse pull, hand cast by Italian craftsmen shimmers with mother-of-pearl inlay. 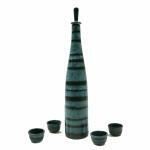 Jerry experimented with a white matte glaze over a black glaze to produce the bold blue and black stripes on a bottle and coordinated wine cups. 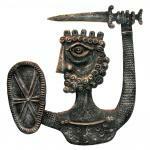 Brandishing a sword overhead, the 25-inch by 26-inch Warrior King bas relief evoked a Picassoesque quality despite its historical subject. The sand-cast aluminum enhanced the strong details of the chainmail, beard, and shield in Evelyn’s 1957 design. The original 1969 color drawing for Hoop, showed the warm color key for the hooking. 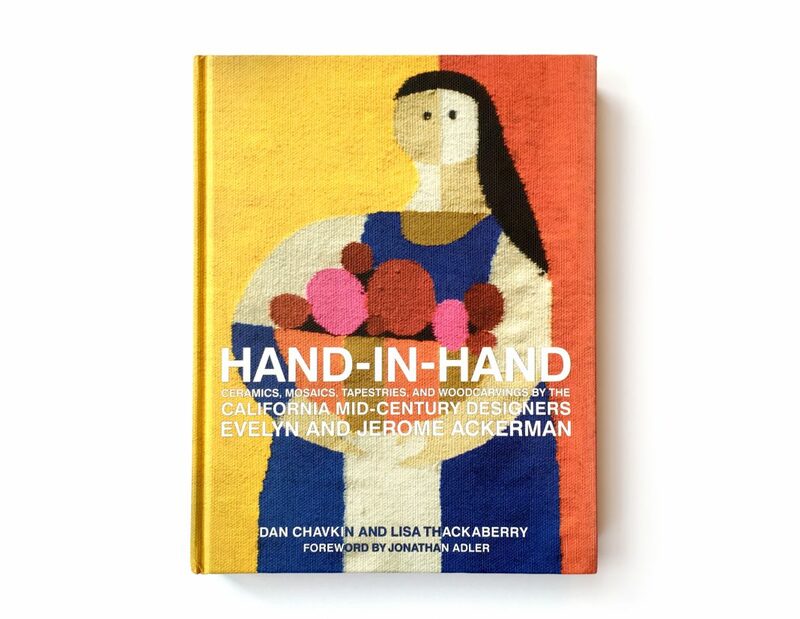 Jerome and Evelyn Ackerman made beautiful designs together for more than 60 years, their work is the subject of the book Hand-In Hand: Evelyn and Jerome Ackerman published last month by Pointed Leaf Press. The couple, Evelyn died in 2012, created sculpture, ceramics, textiles, and functional art sold to designers, and incorporated into restaurants, hotels and other building projects. 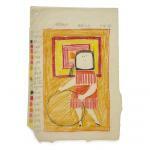 The Ackerman style is bright, playful and animated and epitomizes the joy and lightness in midcentury California design. Photographer Dan Chavkin and former Los Angeles photo editor Lisa Thackaberry edited the book, a gorgeous homage to the Ackermans. Designer Jonathan Adler is a big fan as well, contributing a foreword where he enthuses over the love and childlike joy in Ackerman world. Jerome, who turns 95 in January, continues to lecture on modern design and will join a panel of experts on 20th century decorative art at a tribute during Palm Springs Modernism Week in February. 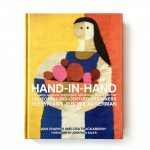 Here are some of my favorite images from their new book Hand-In Hand: Evelyn and Jerome Ackerman.